Travel has been a passion of mine since a very young age. Staying true to my astrological sign, the truth-seeking Sagittarius, travelling gives me the sense of freedom and happiness. Travel as my career was no accident. Just me following the truth of my heart. Being my own boss and running my travel business gives me freedom and the opportunity to work as I travel and explore, this makes me very happy. 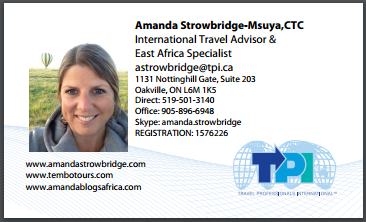 As an independent agent with Travel Professionals International, I am here to put the fun back into your travel plans. Writing about my travel experiences is a new found joy as well. I started AmandaBlogsAfrica in 2012, when I decided to make Tanzania home for half of the year. It’s been such an adventure living with my husband in the “bush” the past five years, in some of the best National Parks and Game Reserves in Africa. It’s experiences like this that keep me wanting to explore more of this amazing world we live in. Inside the underwater room at Manta Resort, Pemba Island (our honeymoon).